There are so many banks in Delhi & NCR and at times, it is difficult to decide that which bank would be the best one for you. Different banks have different facilities and features in addition to the minimum amount that one needs to maintain in the account to avoid any penalty. Citibank is my favorite bank if I see my past experience with different private banks. I have been using the services of Citibank for last 7 years, initially I got it as my default salary account but after that whenever I get an option to choose from a list of available banks, then I always select Citibank. I have used their Suvidha bank account which got converted to a normal savings account where I was required to maintain a minimum balance of Rs. 25000 and then the minimum balance amount has been increased to Rs. 100000. Most of the time, I don't maintain this balance, the poor me :) and pay the service charges for not maintaining the minimum balance but still I am using their services because I like it a lot and they are worth getting more and more customers. The IVR is a standard one unlike banks like HDFC who does not have a proper IVR where the customers can't verify their TPIN to know the details of their bank account or credit card and everytime they need to talk to the representative, even if they need to know the availbale balance or something. The representatives are nice and polite, till now I have only felt once when I was thinking if my call really routed to Citibank or to any other bank rest they have been awesome in customer service specially when I talk about the banking department. I also own a Credit Card from Citibank and have been using it for the last 5 years without any issues and willing to use it unlike my HDFC card which I am gonna close soon and cover up the things in another post. Recently, I got a query on my Citibank's credit card for which I had to interact with them a number of times as few of their executives could not answer it and this is the sub-domain where I think they need to improve the customer service. I do not think this because of my recent experience with the card divison but forced to suggest this when I compare the card service agents with their customer service agents for banking. I have not visited the branch for even seven times in my relationship with them for last 7 years. As such, there was never any need and most of the work can be done via their phone banking, internet banking and ATM services as they have real quick pick up of cheques and documents from the ATM itself. I would like to thank their executives like Abhishek Sood, Praveen Kumar Rawat (I will keep updating the list as per my experience) from banking department for providing a nice customer service experience. I would like to congratulate their service head Mr. Amit Choudhary for maintaining such a wonderful team and wish if the same could be done for the Card department as the executives don't even know the name of their depatment head though the executives from the banking division told me the name at the first go itself. Yesterday, I completed 5 years of banking relationship with Citibank for my currently active account and then I thought to complete this post as it was in drafts for a long time. Citibank is already in my preferred list and whatever services I would need in future then I would prefer them first, instead of even thinking for any other bank. 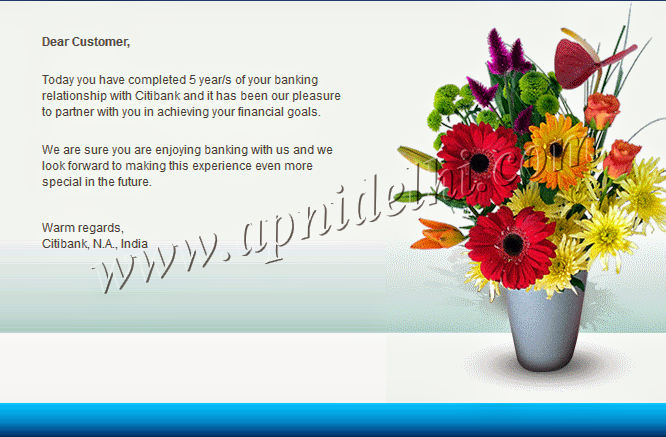 In future if I will apply for a Home Loan or any other product then surely Citibank would be my first choice. As of now, the only service that I need or expect from the banking divison is the generation of a Virtual Credit Card from my available balance so that if I wish to transact on a website where I do not want to share my original card details then I can generate a virtual card of the required amount to complete the transaction. The facility is provided by Kotak & HDFC bank to their savings account customers and credit card holders so was just wondering when Citibank would launch the same. Overall, it has been a pleasure experience with Citibank and I hope it would keep on improving with time. If you have the similar experience with any other bank they do let us know and also share your views about Citibank with us. Subscribe To Stay Tuned With Us! Would You Like to See AAP in MCD as Well? How To Download Aadhaar Card & Update Your Aadhaar Data Online?